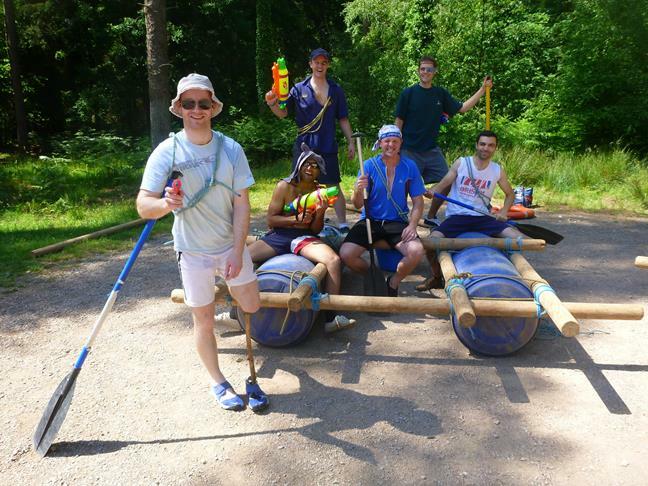 Raft Building - Hilarious competitive team activity, fun for any group. 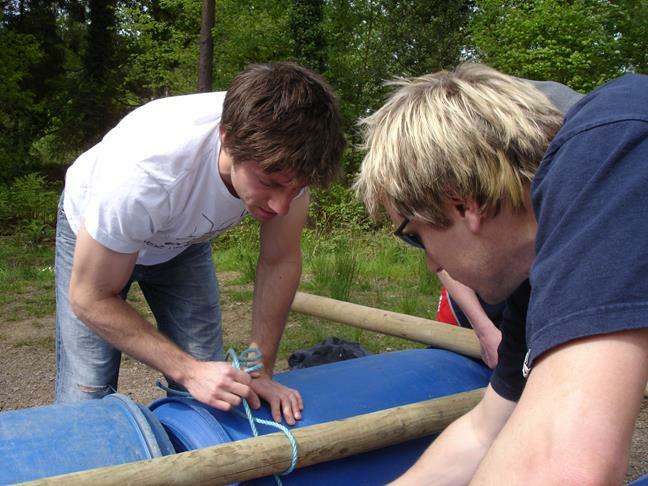 Raft building in the Forest of Dean, can you imagine a better team building outdoor activity? Your Team is given the bare basics of ropes, poles and plastic barrels and then they have to design and build their own raft. They then have to work together to launch their raft with it falling apart and then paddle it around a course. It's enormous fun for all ages but co-operation and communication are essential if you are not going to be left with a pile of floating sticks and barrels. 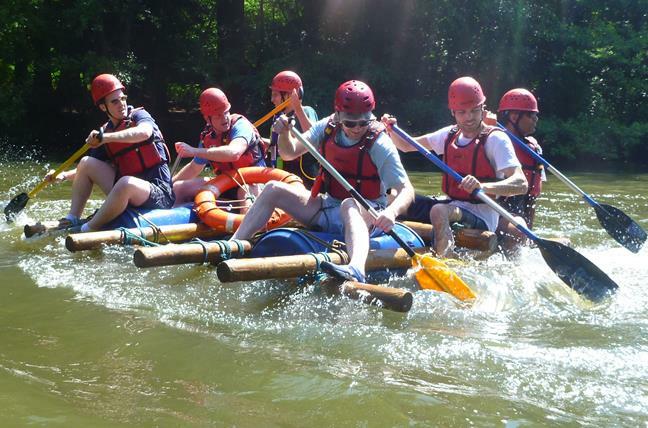 Corporate clients can include raft building as one of the activities in a race day where planning, timing and execution are critical if the task is to be successfully completed. Groups get very rapid feedback on how well they are working as a team when the knots start coming undone and things look decidedly wet. 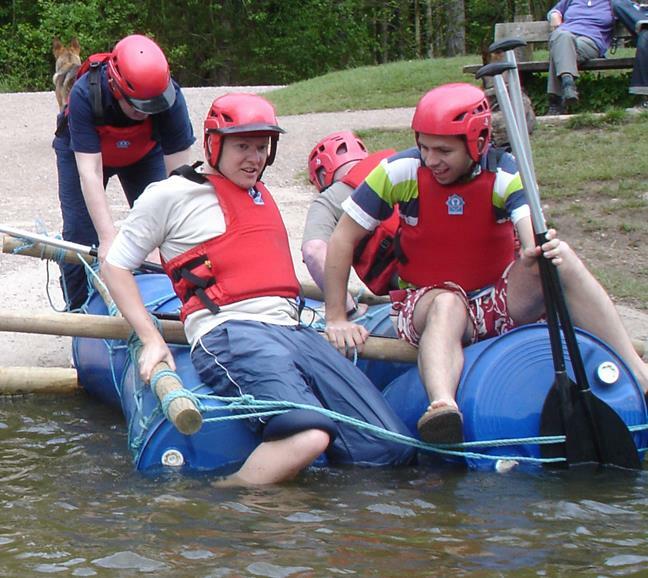 Raft building is suitable for all ages and we can travel to areas in the Forest of Dean, Gloucestershire, Herefordshire and the Wye Valley if you don't want to travel so far. For those who can travel we can offer you raft building on a beautiful lake in the Forest of Dean with a purpose built construction area and launch site. So if you want a fantastic fun filled day with teams designing, building and finally racing their rafts then you really should give raft building a try. 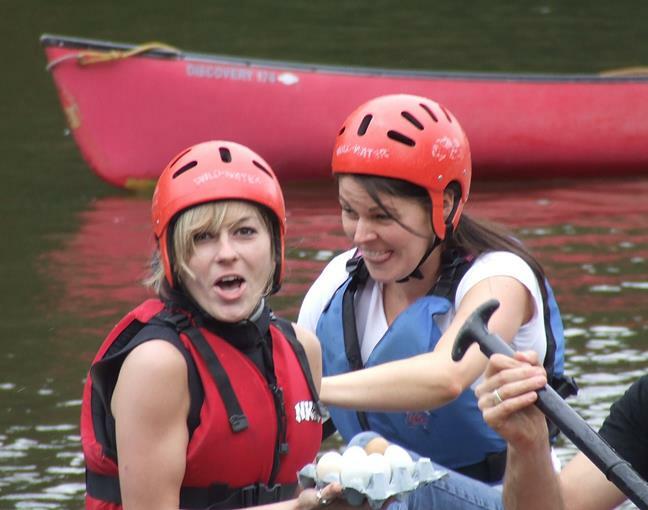 Our Raft Building sessions can also be tailored to suit any group, so whether you are searching for some team building activities for your company, something exciting for a group of friends to do, an activity that all the family could engage in, or just want something to suit a Hen or Stag Party, then we can provide a raft building session just for you. 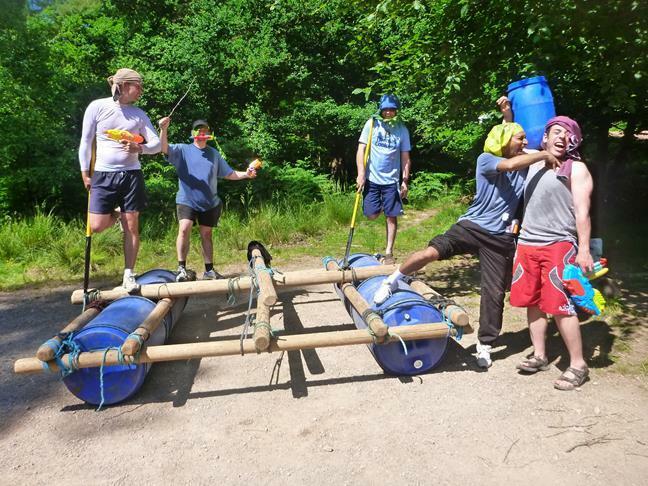 We can also incorporate other challenges within the raft building session if you want to include leadership and planning as a part of your team building program. 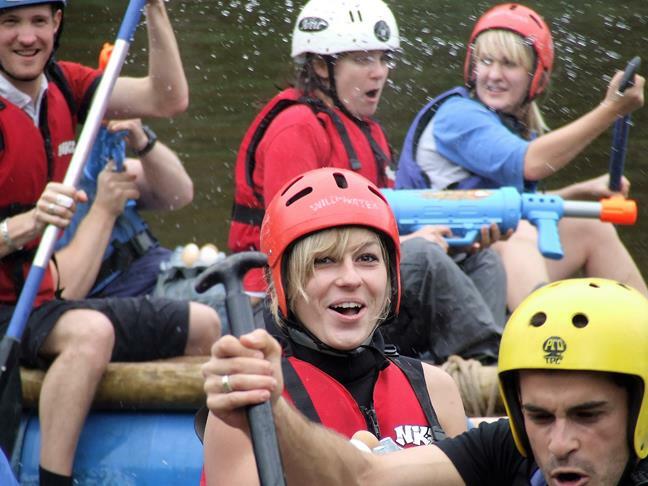 During the raft building session we will be taking photos and videos of you and your party. We will then send you all the pictures so that you can relive those moments again and again. If you want to bring your own cameras or go-pro's etc. you can do so but it will be entirely at your own risk. MIIIIIIIIIIIIIIIIIIIKE!! Thanks so much, the activities were fantastic...everyone said how much fun they had and really enjoyed the day (some were obviously more competitive than others!! ha!) Cant wait to see the photo's!! thanks again! I thought the Team Challenge in the morning was great and I loved every minute of it. It really woke everyone up and it was great seeing everyone mixing in together forming good bonds. Everyone was raving on about it afterwards. What an amazing session! I didn't really know what to expect and was a bit concerned as we were a very mixed bunch with some extremely active types and some couch potatoes (myself included) but fair to say everyone in the group had a great time. The challenges got us all going, dispite the hangovers and at the end we were actually running to get to the next task. Thanks for a great start to our Stag Party. Thanks for an awesome day, we really enjoyed the challenges especially getting through the rubber tyre (Bruce in particular!!) you also managed to keep us to the rules so there was hardly any cheating. The BEST TEAM WON however. Thanks again. Hi Michael A massive THANK YOU from all the girls..... (Sooz, Lynds, Sal, Lotty, Sam, Kathy, Kate & Jane). We all had the most fantastic, challenging & entertaining experience...!You were amazing :o))) We are all looking forward to our next challenge in the Spring of 2017. Thanks for a great day on Saturday, the girls had a really good time and lots of laughs! We can live on Tammi's driving experience all year! Thanks for the photos, received them yesterday, there are lots of amusing pictures!! !Thanks also for all of your help to make it such a memorable and enjoyable day, it really was fabulous.